The Research Excellence Framework also assesses the impact that the research has outside academia. The case studies below are a selection of the research submitted by the School of Sport and Exercise Sciences. Kent contributed and responded in various ways to the London 2012 Olympics. 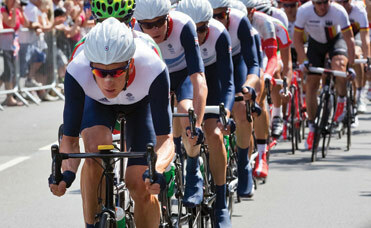 Research ranged from assisting the training of British cyclists to the development of an anti-doping test. Research by Sakis Pappous has challenged conventional wisdom that sporting mega-events automatically lead to health benefits for the host population. One of the key pledges of London’s Olympic bid was to create a legacy of increased sports participation across the UK. Yet, at the time, there was little evidence to support this claim. Pappous’ study looked at long-term gains in sports participation in Greece following the Athens 2004 Olympic Games. The results of his analysis indicated that, rather than producing any sustained increase, the Olympic Games in Athens only led to a temporary rise in sports participation and physical activity. These findings were debated in the national media, including the BBC and the Guardian. The research also informed debate within Parliament. Internationally, Pappous’ evidence has influenced policymakers in Africa, South America and Europe. A mixture of sports science and advanced mathematics was used to assist the GB Olympic Cycling and British Triathlon Teams and the British Paralympic Team in the London 2012 Olympics. The method, developed by Louis Passfield, was under embargo until after the Olympics to give Team GB a competitive advantage. It relied on analysing video footage from 360 world-class sprint races, calculating which tactics had the highest probability of success. In addition, the research used mathematical modelling to study the training process, analysing power output from the bicycles of elite cyclists. In an earlier research project, Passfield collaborated with Brighton academics to develop the world’s first accurate virtual model of cycle and rider, used to emulate racing conditions.